I remember a day when hairbrushes were boring and all looked the same - well that's definitely no longer the case. The new Nanokeratin BeFri Brush isn't quite like any other I've come across before in every respect; how it looks, how it works and what it does. The BeFri Brush is packed full of super flexible, anti-static bristles - 142 of them to be exact - that are attached to 8 kinematic free moving arms that are meant to help the brush glide through the hair. The vented design also means the BeFri Brush can reduce blow drying time, due to the warm air being able to circulate around the roots. For use on both wet and dry hair, by brushing first with it held vertically and then horizontally, Nanokeratin promise effective brushing that conditions and strengthens the hair, leaving it healthy, shiny and full of body. The retail price is £19.99. I have thick, frizz prone hair that sits a couple of inches below my shoulders and is extremely knotty when wet. I find that the BeFri Brush does do a good job of detangling when used as recommended, however it certainly isn't pain free and so when it's wet, I still prefer to use my trusty Wet Brush. 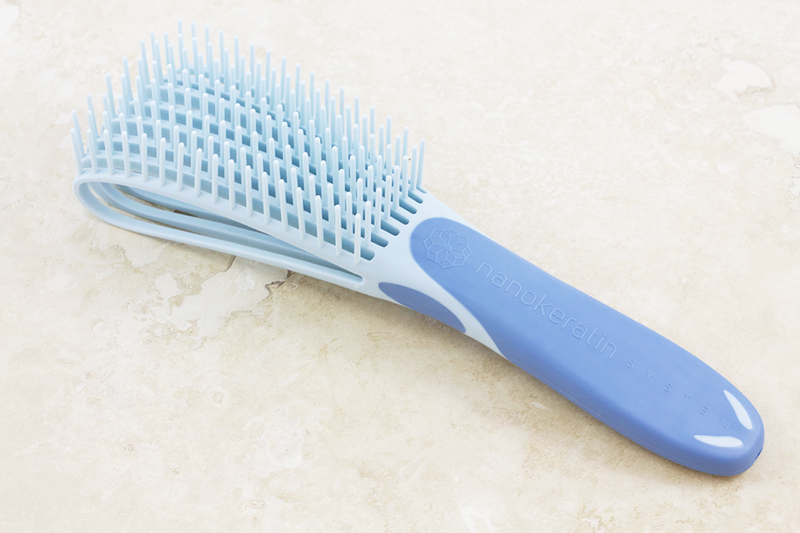 The bristles really work their magic on my hair when it's dry - I'm so impressed with how it conditions every strand, making it sleek and smooth, completely eliminating frizz. I also like the fact the bristles keep the same width from end to end - not having the little round bobbles on the end stops my hair from getting caught round them and so I get a lot less fall out and breakage. I have to mention the handle too - what can I say, I like a good handle on a brush, which is why I've never bought the Tangle Teezer. It's ergonomic, so is very light and comfortable to hold and easy to grip. The Nanokeratin BeFri Brush is a very welcome addition to my slowly expanding brush collection. I think it would suit all hair types and is worth the splurge for the benefits to the hair. Find it online here. Have you tried the Nanokeratin BeFri Brush? Which brush do you reach for on a daily basis? P.S. This post contains a PR sample. This does not affect my opinion of the product. I'm definitely a Tangle Teezer girl :) I've noticed that my hair has been in such a better condition when I started using it. If I use other brushes it feels so weird - especially when they have handles! This looks really interesting - great that it makes blowdrying quicker! I love the look of this brush! It is so different! Such a cool look brush! I'm definitely intrigued! !